Sadly Mose Allison passed away on November 15, 2016 at home. His family would like to express their gratitude for all the kind words and thoughts they have received. Produced by Pete Magadini, IBis Recordings, Marin County, California. Recorded in Fairfax, CA in 2006. CD release date: September 18, 2015. 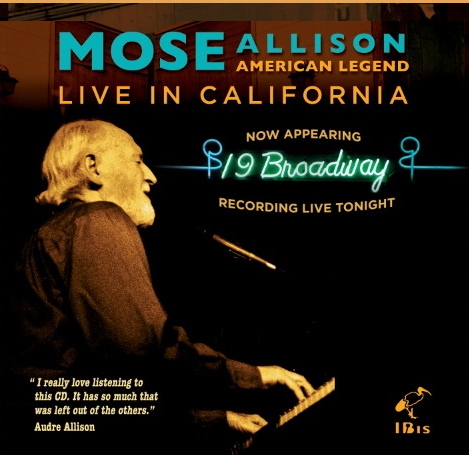 We are happy to announce the release of the new live CD entitled Mose Allison American Legend, Live in California, available September 18, 2015. Produced by drummer Pete Magadini, with Bill Douglas on bass. The disc was recorded in 2006 at “19 Broadway” in Fairfax, CA and is distributed by City Hall Records. Mose Allison was honored as one of the 2013 Jazz Masters by the National Endowment for the Arts at Lincoln Center on January 14, 2013. 2013 recipients: Lorraine Gordon, Mose Allison, Lou Donaldson & Eddie Palmieri. In 2012 Mose was honored with a blues marker on the Mississippi Blues Trail in his home town of Tippo, Mississippi. Mose Allison, pianist/singer/composer, has been a major influence on musicians of the last 50 years and has spent a good deal of his life touring and playing in jazz rooms all over the world. His songs have been recorded by many, among them, The Who, Van Morrison, Bonnie Raitt, Elvis Costello, The Clash and Diana Krall. His singular style, a unique blending of jazz and blues, and his profound lyrical wit, mark him as a true American original. This site and contents ©2018 Mose Allison All Rights Reserved.